With several flights now on the airplane and things going really well in testing, I switched gears from verifying basic airplane and engine functionality to determining (verifying) aircraft performance. I am a big believer in doing your own flight testing. 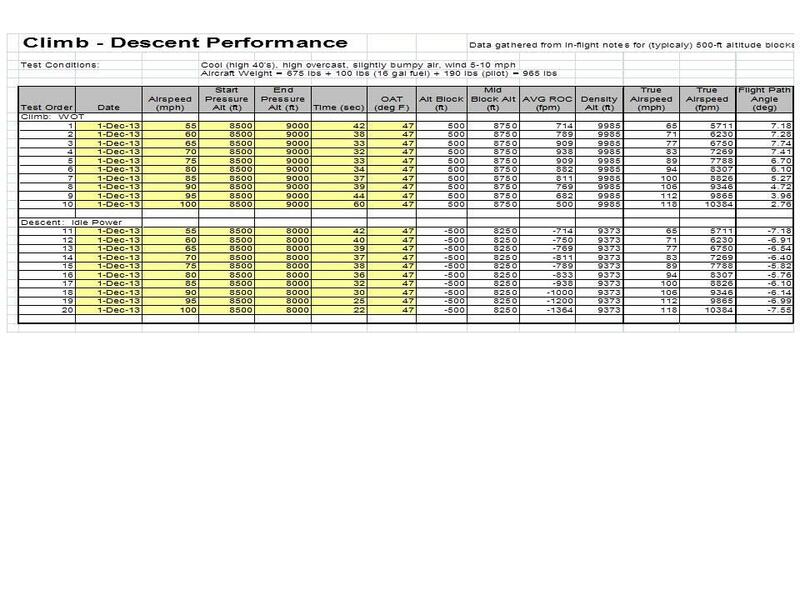 Not only does it determine *your* airplane performance and handling characteristics, but it is a great way to get very comfortable with your airplane and build confidence in your craft. Every Sonex owner that has seen "Right Seat with Tony Spicer" knows the plane will loop, roll, spin, and stall without any surprises, but unless you actually do it during your flight testing, there will always be a bit of doubt or concern in your mind whether *your* airplane has any skeletons in the closet. 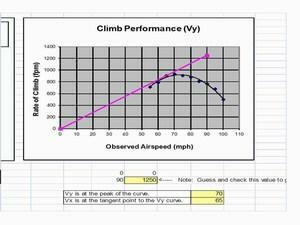 A good place to start performance testing is with climb tests to determine Vx and Vy. 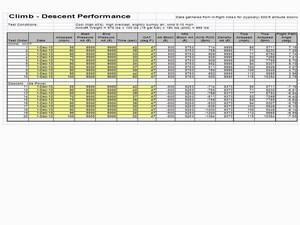 Sonex Aircraft publishes these numbers on the web and in the flight manual included with every plan set. But, once again, determining them for yourself is very valuable. 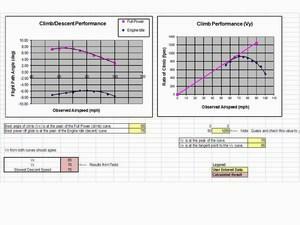 There are several good articles on how to do this test, including a discussion in AC 90-89A on Flight Testing Amateur Built Aircraft, but I use my own spreadsheet. I've based this off various others that I found, and I can't take credit for the original idea, but I've tweaked it to my liking and have used it for years. This is the first time I've shared it, so have at it! The procedure is simple. You will fly the airplane through a series of "saw-tooth" climbs and descents. The goal is to have data collected at different airspeeds but all flown in the same altitude block to normalize the data. 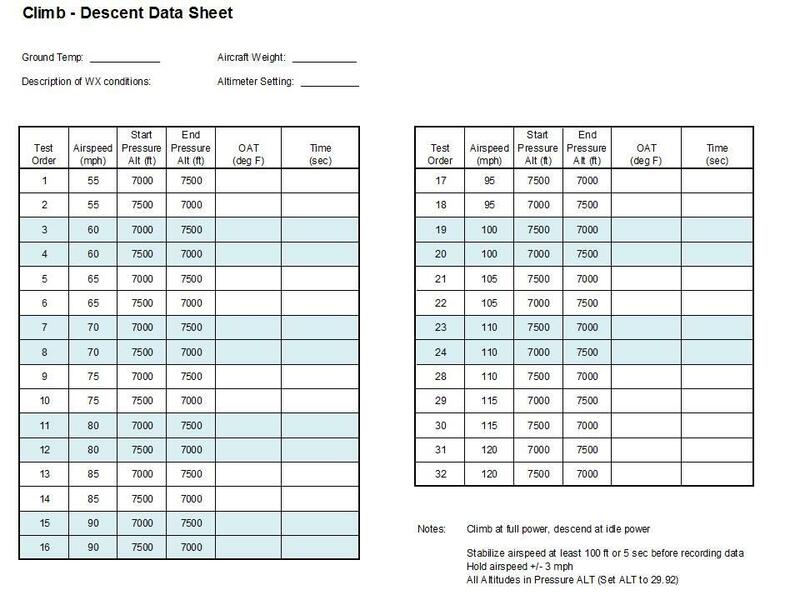 I print out a data sheet pre-filled with the various airspeeds and altitudes and take it with me in the airplane on a clipboard. In flight, you simply fly the airspeed as precisely as possible through the altitude block and record the elapsed time in seconds to climb through that block. Take time to gather quality data. If a particular test run isn't going well, abort and retry that airspeed. 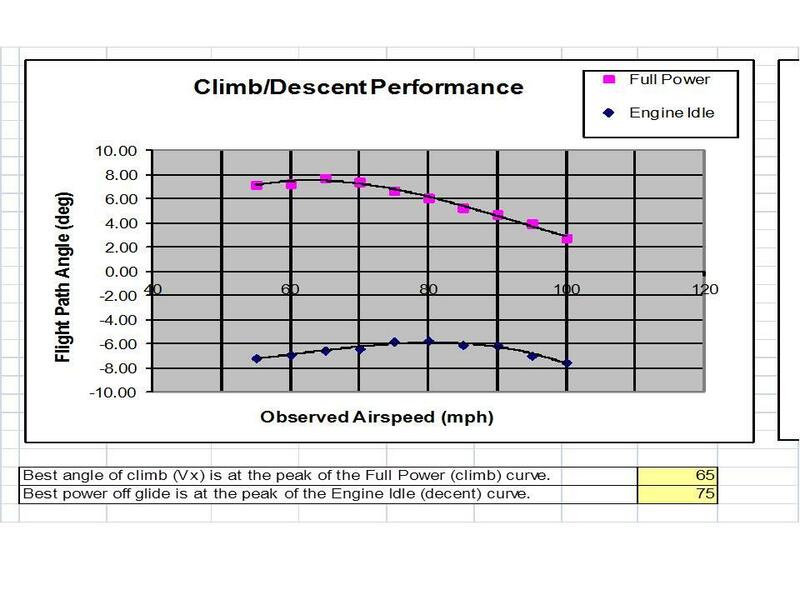 If the data is off, the climb speed varies more than +/- 4 mph, or you forgot to start/stop the timer, you'll be stuck with poor results. Garbage in, garbage out! 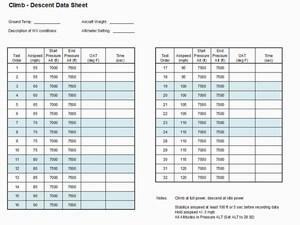 Once the flying is complete and the data sheet has been filled out, the data is entered into the spread sheet to calculate the results. It's not quite automatic, but it's pretty easy to produce the results. Cells in yellow are entered from the datasheet, and everything else is automatically calculated according to the formulas embedded in the spreadsheet. The graphs automatically plot the data and apply trendines to the individual points as well. From this point, all you have to do is "eyeball" the appropriate number on the Vx graph at the tangent point and estimate the speed where the trendline "peaks" and those are your Vx and Vy speeds, respectively. 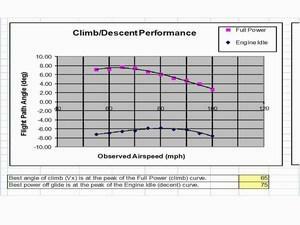 This is a good time to discuss the benefit of calculating climb angle in addition to rate of climb. 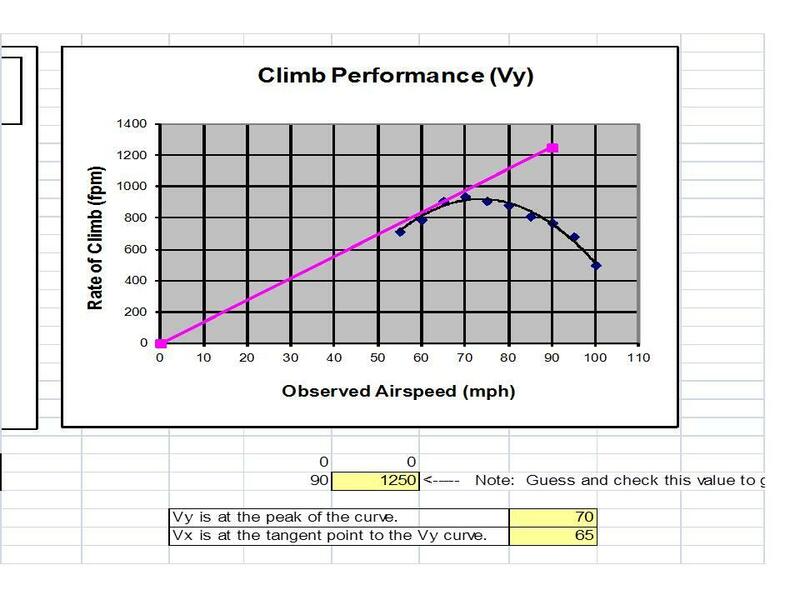 Climb angle is not as intutitve to grasp as rate of climb, but the calculations are simplified by working directly with the angles. 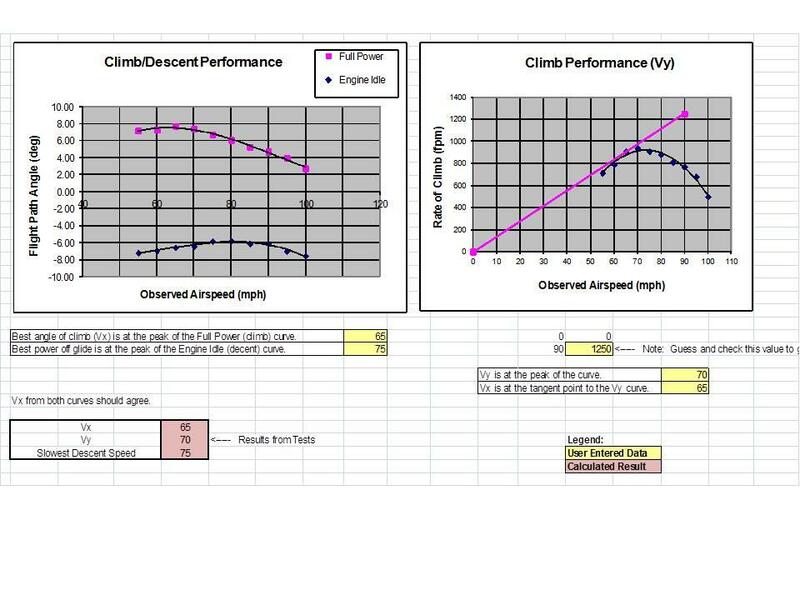 For most of the sheets, you can simply disregard the climb angles, knowing they'll be used later on. I've included my spreadsheet file to illustrate this. The data contained in it was collected during the early flight testing of Sonex 1374. At the time of the test, Sonex 1374 was configured with big 5.00x5 tires, no gear leg fairings or wheel pants, late-model hydraulic lifter Jabiru 3300, Sensenich 54-60G prop sold by Sonex Aircraft, flying at 975 lbs at roughly 10,000 ft density altitude.